*** WINNERS *** Heather and Dara are Living the Life of Riley! CONGRATULATIONS! I want to give a big and hearty CONGRATULATIONS to Heather, the winner of the Energizer Weather Ready Rechargeable LED Light! Heather now has 48 hours to confirm! I also want to give a big and hearty CONGRATULATIONS to Dara, the winner of the ThermaCELL Mosquito Repellent Appliance! Dara now has 48 hours to confirm! 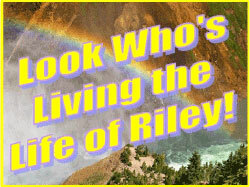 *** WINNERS *** Teresa and Terri are Living the Life of Riley! CONGRATULATIONS!